This post was last updated on July 30, 2014 to include new images and a recipe video. I have had it up to *here* with store-bought tortillas. Now, usually, homemade anything is better than store-bought. Agreed? The same goes for homemade tortillas. Yes, they require a little bit of work and make a little mess, but they are so ridiculously good — you won’t even care. Go ahead. Try them out once. 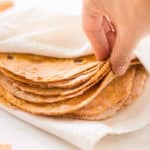 I’m betting, once you bite into your first hot, homemade, melt-in-your-mouth flour tortilla, you won’t be sorry. Or the second. 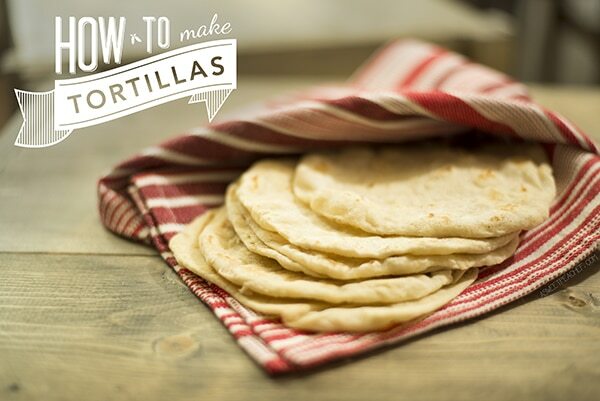 If you want to make homemade corn tortillas watch the video and get the recipe here. 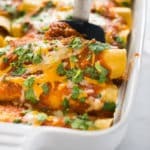 Watch me make this recipe! 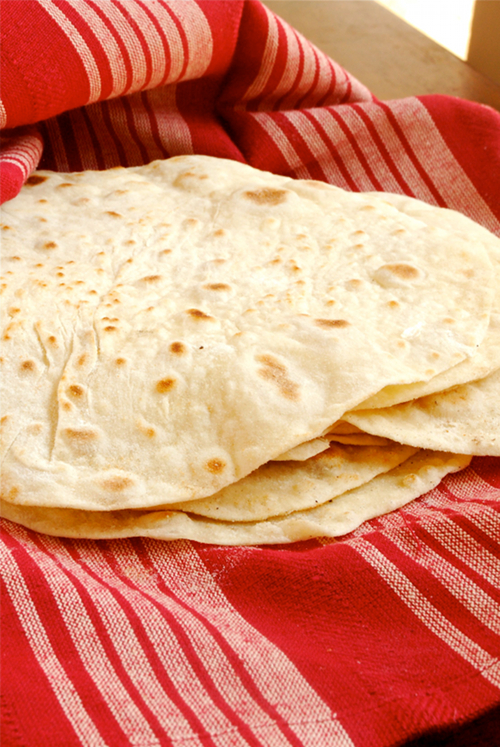 These homemade tortillas are to-die-for-delicious. 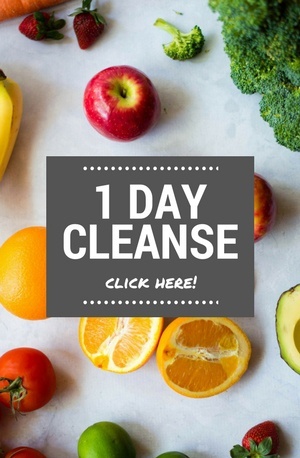 Please try them - you won't regret it! Drop 1/2 cup lard by the spoonfuls into flour mixture and, using a pastry cutter, your fingers or a fork, cut lard until it crumbles and is evenly dispersed in the flour. Slowly add the hot water and stir together until mixture sticks to itself. If not quite moist, add 1-2 more tbsp. lard, as needed. 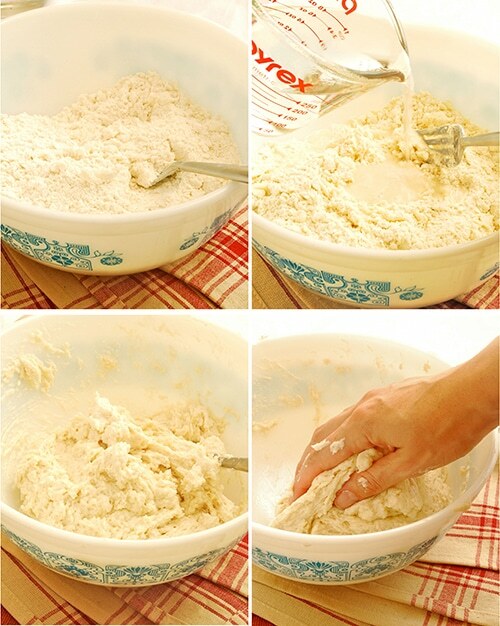 Knead, in the mixing bowl, for 3-5 minutes or until dough forms a ball and becomes less sticky. Cover bowl with tea towel and let rest for 1 hour. These are the best tortillas I’ve ever made. Thank you for sharing your recipe. This recipe calls for far more fat than most recipes for flour tortillas, and also baking powder which I never use. I make flour tortillas occasionally and typically have excellent results. Was curious about this recipe that was so different so I tried it tonight, and it did not work well for me at all. It was very very greasy, and the final result had a texture more like a cookie which I suppose is because of the baking powder. I can’t understand the purpose of the baking powder in a tortilla recipe, especially so much of it. Interesting that other people had success with this. On the other hand, the flavor was good, so we sort of just dunked them in our fajita filling. I substituted the 1/2 cup lard for 1/2 cup mashed avocado and they turned out great! I just made these and they are just perfect. Thank you so much for the recipe. The best tortillas I have ever had/made. I’ve made these a couple times now, and they’re great. I just can’t seem to make them round though. They always end up in strange stretched out shapes, which makes them hard to roll for burritos or wraps. Is there a trick I’m missing? Hmm…it’s really in the rolling it out. Try to keep it as even as possible as you roll them out and turn as much as you need to make it that way. I hope that helps! I found a cast iron tortilla press at our local HEB for 19 dollars. Amazon has them too. It might help. I was really excited to get this recipe since I am allergic to soy, which is now found in store bought tortillas. Mine turned out thin and not soft at all, as soon as you bite it will break out into small pieces. Do you know what could be the reason? Oh no! How did they feel when you were rolling them out? I’m wondering if they weren’t moist enough for some reason? Do you think it would be ok if I refrigerate the dough balls for a day before rolling and cooking them? 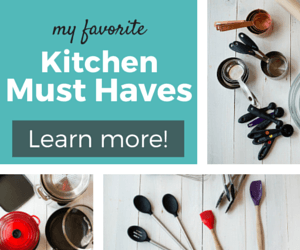 I no longer have to keep looking for the perfect floured tortilla! thank you! These are so soft and yummy! My search stops here! Now can you come up with a yummy corn tortilla? please????? I’m trying these today with butter instead of lard and with homemade bread flour. To make your own bread flour, just add 1 tsp vital wheat gluten for every cup of all-purpose flour. Good to know, Jen. Thanks! 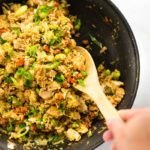 great detailed recipe! thank you so much. I used butter instead of lard, turned out kind of oily but really soft and delicious. Will try using coconut oil next time. Thanks!! I used coconut oil rather than lard, and to cut time in time for my dinner I only let them sit for 1/2 hour. They were delicious! The rolling pin didn’t work too well for me so after a few swipes with it I just hand pressed them out. The thinner the better! Mine weren’t quite as pretty, but they sure were good! Thanks! We have found out don’t get in a hurry, let them rest when you form the small balls, and you can get them rolled so thin you can almost read a newspaper through them. Also makes them very pliable. Have to try your recipe instead of our old timer one. Had to tell you how big a fan my family is of this recipe. We will never buy store bought tortillas again. These are on our table at least once a week! 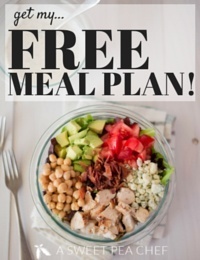 Thanks so much for sharing such an amazing recipe!! Any thoughts about turning this into a whole wheat tortilla? Could you substiture Whole wheat flour for the AP to get more fiber and whole grain?? Is there oil in the skillet?? Thank you for this homemade tortillas recipe. I will surely try this. 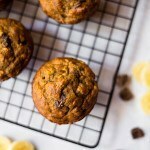 I have made these before (not with your recipe and I bet they will be even better!) but the problem that I had was getting my very thin tortilla safely to the pan without folding and overlapping during the trip. Any ideas? They are so amazing but was frustrating because of my lack of coordination, maybe? 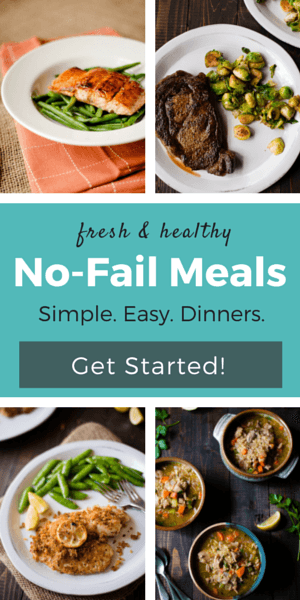 Thanks for the recipe – can’t wait to try them! What about using a well-floured pliable cutting board and just sliding them right off onto the pan? 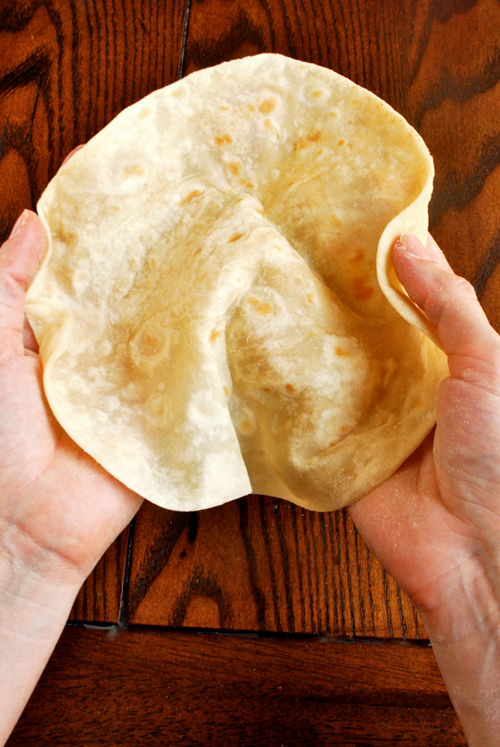 Or, just keep the tortillas a little thicker. Thank you! 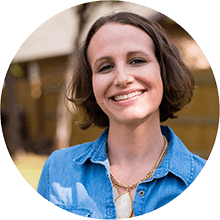 They are amazing – really! As I can’t have yeast, I made these instead of flat bread and since I have to make them thicker, yes, because of my lack of coordination, they tasted just like flat bread. YUM! 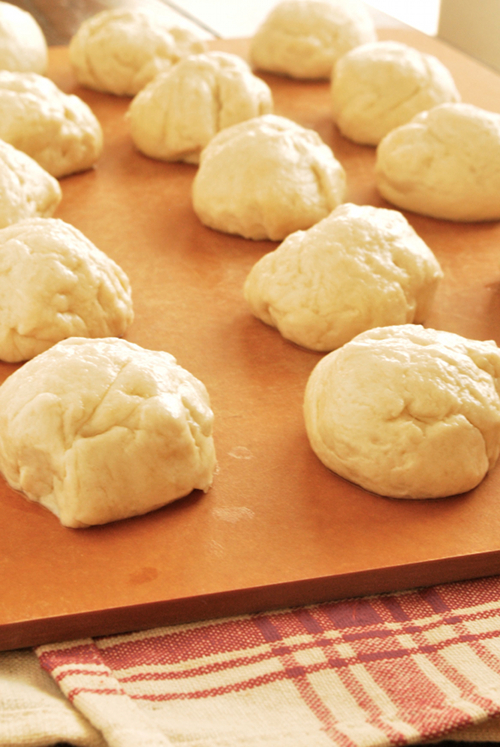 Try to gently roll the tortilla around your rolling pin and then unroll into the pan. I use this trick with pastry dough all the time, but it could work with tortillas as well. 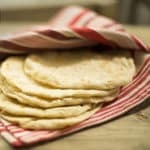 Thank you for this home made tortillas recipe.I would like to try make this.Homemade is really good. Perfect n soo fresh! There is nothing like homemade tortillas 🙂 Thanks for the recipe. Would love to try it.